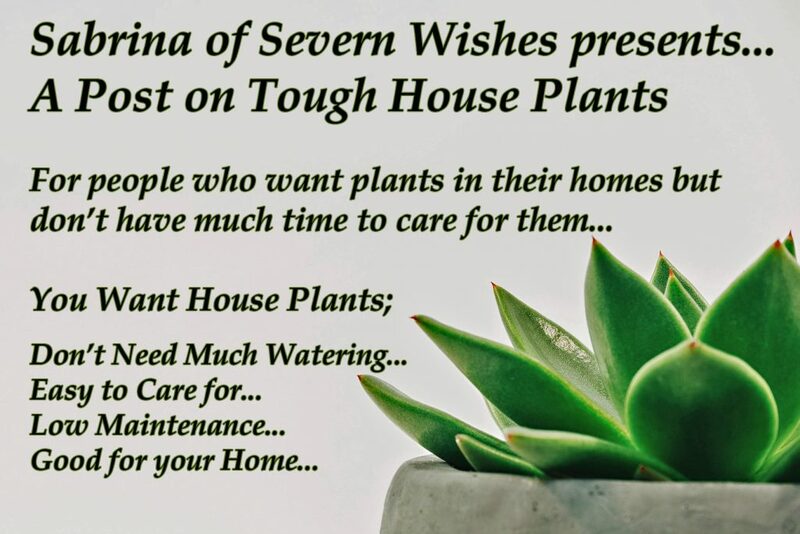 There are some pretty hardy house plants out there that don’t need a lot of maintenance, that are perfect for people who often forget to water. If you are looking for some really easy to care for plants for your home, then check out all the varieties below. Let’s first start with a flowering plant that is so beautiful and you only need to water it once a week. Once it flowers the buds can remain for weeks at a time, plus it comes in many varied sizes and colours… it is The Orchid. The Orchid has over twenty eight thousand registered species, though many grow in the wild throughout Asia, some varieties have been adapted to become house plants. Here in the United Kingdom they are now readily available, not just at garden centres but even from large supermarkets. They come in various sizes of flowers too. 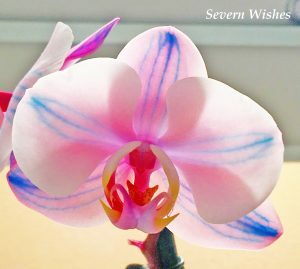 The most common available is the Phalaenopsis or the Moth Orchid. These two images I have included in this post depict how it usually looks like. Each stem can grow between six and twelve beautiful flowers that emerge from buds. 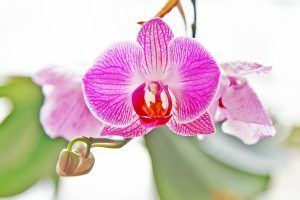 You only need to water an Orchid plant once a week, it might need to be thoroughly quenched if it has many many flowers in bloom. You can tell by looking at the flowers if the petals are not smooth. Also if you give it some water and it drinks it all up immediately keep adding tiny amounts until the drinking slows. It needs to be placed in a well lit window but with no direct sunshine during the day. Orchid plants like the light and like to be warm but not hot, and do not allow it to get very cold. Remove it from the window during the Winter overnight. Remember to gently wipe the leaves clean of dust every couple of weeks, and keep an eye on any blooms that have ended. You can cut these off gently at the stem where they join on. Careful not to damage a stem that has buds on it. 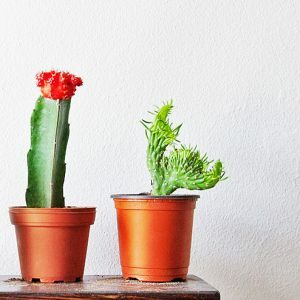 A very cool plant to have in the home is the Cactus! The definition of a Succulent is a plant that has thick fleshy leaves or stems that have adapted to storing water. Cacti are part of the Cactaceae family, there are currently 1750 species. Usually found in an array of shapes and sizes, some tiny and others grow extremely tall. Most originate from dessert climates but some also comes from forests. 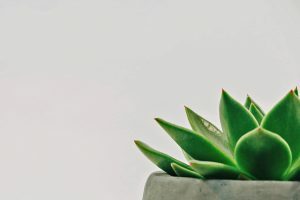 The ones that you have for your home are known as succulents, but not all succulents are cacti (I will show you what I mean further down the post). Many Cacti like a warm home, a window with plenty of light and fast draining pots that don’t require you to water them very often. Years of evolution has insured these hardy plants store water to keep themselves sustained in harsh environments. Cacti are also very good at adapting to our various seasons in the west of the world. The Christmas Cacti needs to be allowed to dry between watering, look at first few inches of the soil and if it’s damp wait another few days. It needs to be watered less in the dormant Winter phase. When the plant is flowering make sure you don’t let the plant dry out and don’t over water it either, doing so might prevent future flowering. These plants need medium to high light, and if you choose to fertilize do it three times in the summer to promote blooms. Pincushions are a group of approximately 200 species of ball-shape cacti, they are the most common cacti that can be grown in the home. Most come from Mexico, they grow in hot climates and can be singular or in clumps. They can often flower indoors. Be careful of the spines they might look delicate but have hooked ends that will be difficult to pull out of skin if you get one trapped. These cacti like lots of light and you should let the soil dry out almost completely between watering. You should withhold water entirely in the winter and allow it to have a cool and dormant period. If you fertilize only do it in the summer months and a maximum of three times. Although these two plants are closely related they do in fact look different. Known as Hens and Chicks because the mother part of the plant is known as the Hen, and the rosettes that grow off from it are the Chicks. Sempervivum Tectorum has rosettes but the leaves are flatter and also more pointed. Echeveria Elegans has flower shapes rosettes that have rounded edges and are flat. Both of these plants should be allowed to dry somewhat between their watering, over watering will cause root rot. Water them very little during their dormant part of Winter. 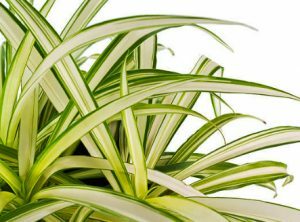 Another easy to care for plant is the Spider Plant or Chlorophytum Comosum is its scientific name. I had a plant of this kind from the age of eleven to twenty four (until it got infected with flies one summer and that was the end of it sadly). 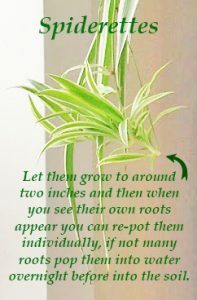 It often gave out small flowers and in turn baby plants (known as Spiderettes), that you simply wait for roots to appear and then carefully cut them from the stem and re-pot them. Those Spiderettes from my original plant are still around today, several of my family have them. This is also a great plant for someone younger, for someone who perhaps wants to start learning about and caring for something flora and fauna. It needs very little watering and its leaves need wiping from dust just once a week. Obviously the larger the plant grows the more leaves it has, and the more it would need tending to. But if you start with a small one and grow with it, re-potting it whenever it gets too big for its space, and you should do just fine. 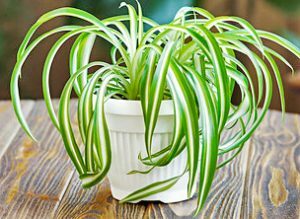 The Spider Plant is a great and easy to care for addition to any home. They also remove the following pollutants from the air in your home “Formaldehyde and Xylene”. Another low maintenance plant is the Begonia and because it flowers for around half of the year it will also be a nice addition to brighten up the home. Begonias are flowers that bloom in spring and summer, they need their soil to dry out before they need another watering, and they require even less watering in the winter when they don’t provide flowers. Begonias come in a range of different colours. In my personal experience they don’t grow very large either, so you can have one in a small pot on a half shade half light window in your home and check on it twice a week. 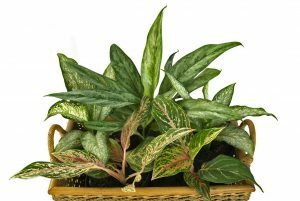 Chinese evergreen plants like Aglaonema are tougher than they look, and come in varieties that have leaves with speckles and stripes. They like medium light, and you only need to water them when you notice the soil is dry. Don’t use cold water on them though, tepid is always best. 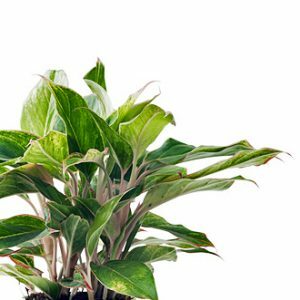 Chinese evergreens often tolerate a range of conditions, although they don’t like to be in a room whose temperature will drop below between thirteen and sixteen degrees. The best average for growth seems to be around twenty degrees, and they also dislike being near to drafts, because this can damage their leaves. Thriving in medium to low light, these plants appreciate well draining soil. Speaking of the soil, the Chinese evergreen likes it to be part soil and part sand. Dependent on the type you decide on will depend on the pot size you’ll need. Do your research before you buy. You can spray the leaves with tepid water if you like which replicates the conditions from its place of origin in the rain forest. If it’s not too cold outside then you could place the plant outside in a safe place away from pets and strong winds so it can have a shower in the rain. You could use a suitable plant food every two months if you feel it is required. I have learnt so much of my love for plants from my grandparents, they taught me a lot when I was growing up. My Nan is still a keen garden lover and often helps me with my house and garden plant choices. My first buying TOP TIP is consult a book or the garden centre experts for the sizes and varieties before you buy anything. My next TOP TIP is that you need to know where it will be situated so that you can best choose the plant suited for the place. For example, some indoor plants love being on a windowsill with lots of light, where others need a great deal of shade and cooler temperatures. Another TOP TIP is to consider how much care the plant will need after purchase. If you don’t feel you have the time to care for it, then don’t buy it. My final buying TOP TIP is make sure the plant that you’re buying has healthy leaves, no infestations in the leaves or the soil and good roots, root rot can mean it’s been over watered and might not survive for long. My final TOP TIP is for people who forget their plants! Maintaining the consistency is key for plants, especially indoor ones. If need be, set an alarm on your phone or write on your calendar when it will need watering, pruning and cleaning (yes some plants need their leaves cleaning of dust). Thank you for reading this blog post today, if you have any plants you love I would like to hear about them. There will be more lifestyle posts coming soon on Severn Wishes. This entry was posted in Home Sweet Home, Lifestyle, Plants, Sabrina's Top Tips by Sabrina. Bookmark the permalink. Wow how very informative! I definitely fall under the category of lazy when it comes to taking care of house plants, or any plants for that matter. I’m extremely neglectful as I just don’t have the time. So my little orchids and lilies are lucky if they get a water once every 3 days. Like I said I don’t mean to be neglectful I just find that plants, and everything in general need to coincide with your day-to-day routine. And mine don’t. Really good read. Loved it.